I am interrupting my celebration of the art of everyday objects to salute a truly great American artist who died on April 2: Elizabeth Catlett. 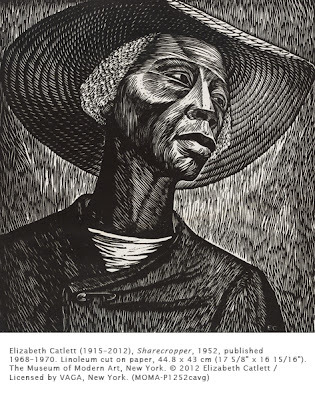 Catlett was not only a massively important figure in the ascendancy of African American art, she has also been a pioneering woman printmaker, sculptor, educator, and advocate for women’s rights. Catlett, born and raised in Washington, DC, originally studied painting. She switched to sculpture after the Regionalist painter Grant Wood (1891–1942) introduced her to wood carving while she was studying at the University of Iowa. Her sculpture style evolved under the cubist/neo-primitivist sculptor Ossip Zadkine (1890–1966). Wood advised her to concentrate on subjects that had personal meaning for her. She thus eventually concentrated on the lives of African American and Mexican women. Catlett was also a prolific printmaker, influenced by the social realist Mexican muralists whose work she saw while studying lithography in Mexico City. In 1958 she became the first woman faculty member in the School of Fine Arts at the University of Mexico, Mexico City. In 1946 Catlett moved to Mexico City where she produced prints and taught in the Peoples’ Graphic Workshop (Taller de Grafíca Popular). The workshop produced inspirational prints about revolutionary period Mexico and sought to raise the dignity and knowledge of largely uneducated poor Mexicans. The iconic image of Sharecropper shows how Catlett followed Wood’s advice. 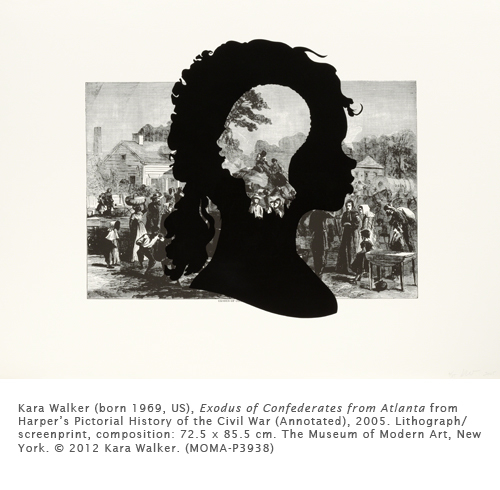 It depicts the hardened and roughened features of an African American woman in the South, working a system of farming that was the result of Reconstruction after the Civil War. The safety pin holding her garment closed emphasizes the fact that African Americans were working in a system that continued to disenfranchise them from mainstream American culture, which was still a problem when she developed the print. Activity: Relief printing from Styrofoam on a subject of personal or social importance. Using the Styrofoam container from the store, clean and trim it carefully so that all the remains is a flat piece of Styrofoam. Using a pen or pencil carve the design into the Styrofoam, understanding that the raised areas are the ones that print. Try to recreate the cross-hatching seen in this print by scratching in fine lines parallel to each other. Use acrylic paint or printer’s ink to coat the surface evenly, and wipe with a cloth to remove excess. Press Styrofoam “block” on the piece of paper and rub over the surface with a wooden spoon to ensure even registration. I really like your article. It’s evident which you have a lot knowledge on this subject. Your points are nicely created and relatable. Thanks for writing engaging and intriguing material. Discovered this on MSN and I’m happy I did. Nicely written post.